Timothy Adarna doesn't deny that he killed his stepfather and set the body on fire. But he claims it wasn't murder. 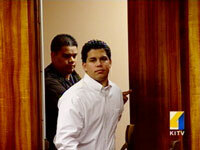 Timothy Adarna is accused of killing his step-father Robert Ramos and then burning down Ramos' Ewa Beach home in November 2006. "It started with self-defense and it ended up as EMED (extreme mental or emotional disturbance)," said David Hayakawa, Adarna's lawyer. Adarna, 20, is on trial in Circuit Court for second-degree murder and first-degree arson in connection with the Nov. 16, 2006, death of Robert Ramos and fire at Ramos' Ewa Beach home. Ramos, 55, died from stab wounds on the sides of his neck, which cut the carotid arteries that transport blood to and from the head. He also had a stab wound in the back of his neck that fractured a vertebra, a stab wound in his back which punctured a lung, cuts on his face, other cuts on his head consistent with a pickax and defensive wounds on his left hand, said Kevin Takata, deputy city prosecutor. Hayakawa said a series of events in the months leading up to Ramos' death had built up the stress level in the Ramos household. They included Adarna's decision to accept early discharge from the Navy, the death of his oldest brother from injuries he suffered when he was thrown from the bed of a pickup truck that Adarna was driving, and his mother's depression because of the death. "They never talked about it; they didn't address it," Hayakawa said. He said Ramos forbade his children from staying in the house during the day on weekdays. On Nov. 16, 2006, a Thursday, Ramos returned home in the morning to get some tools and found Adarna at home and unleashed what had been building up for months, Hayakawa said. "That dam hole in the back burst, and out rushed that emotion and destroyed everything in its path," he said. In the confrontation between the two men, Ramos was holding a pickax, and Adarna a knife he used when diving, Hayakawa said. He said Adarna remembers seeing Ramos' eyes up close, then nothing else until he was on top of his stepfather's dead body. Hayakawa said Adarna does not remember how he started the fire, but remembers when the flames exploded. To illustrate that Adarna was not thinking clearly, he pointed out that Adarna had tried to use water-based paint as an accelerant to start the fire. And he left evidence of what he had done in a trash can near the bus stop where his hanai sister had seen him and briefly talked to him immediately following the deadly events at home, Hayakawa said. "That casual encounter led to evidence which broke the case," Takata said.